It’s that time of the year, and one of my favorite posts of the year! 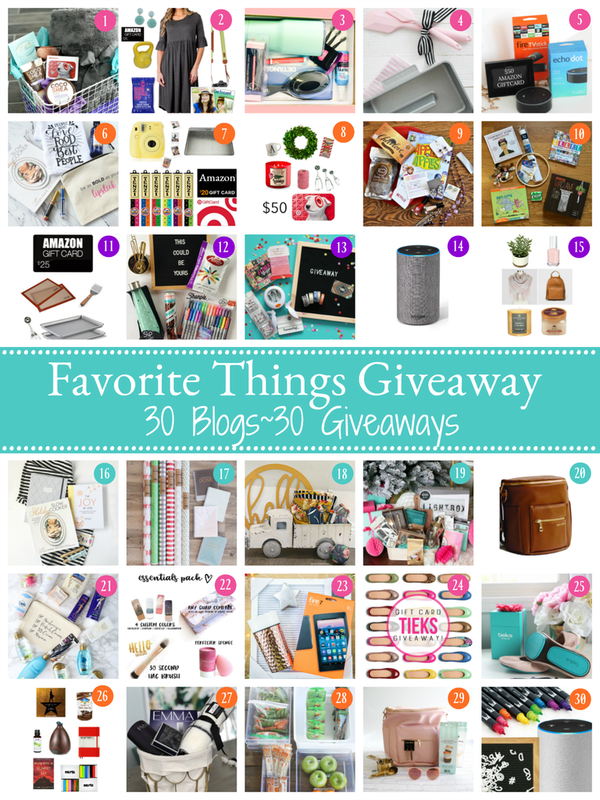 I’m excited to share another year of My Favorite Things Giveaway! I’ve joined with 30 creative bloggers total, also sharing their favorite things, and each of us are having a giveaway. That means 30 winners total! Not only is it a fun prospect to WIN, but they make great gift giving ideas as well. 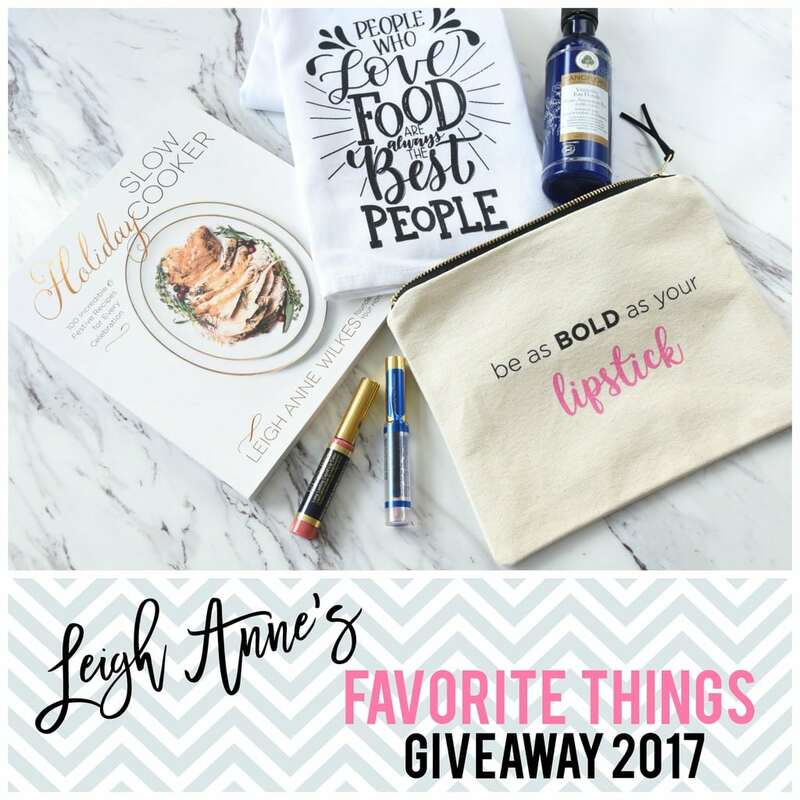 I’m excited about everything I’ve put in my Favorite Things giveaway this year – they truly are my favorite things!! Of course I couldn’t help but include my new Holiday Slow Cooker Cookbook because it is just about my favorite new thing ever!! I’ve had so much fun cooking out of it and giving it as a gift. I recently went to a bridal shower and of course I gave the new bride to be one. It’s a perfect holiday gift for all the cooks in your life. It’s full of recipes that will take you through the year, for every holiday and every day. I’m also including a fun dishtowel I had designed. My sister did the lettering for me, isn’t she talented! You can follow her Beautifully Said account on Instagram. I have a few of these towels for sale in my etsy shop – there are three different designs and make a perfect hostess gift for the holiday parties you may have to go to! There are three fun designs available. Also included is a fun and sassy cosmetic bag from my 42 and Pine shop. Our bags are made right here in Portland, Oregon! Currently, there are 15 different designs and we will be adding more designs soon. I am so excited to share these with you and give one away. You can check out all the bags at our website here. We are also on Etsy. Our bags make perfect girlfriend gifts! 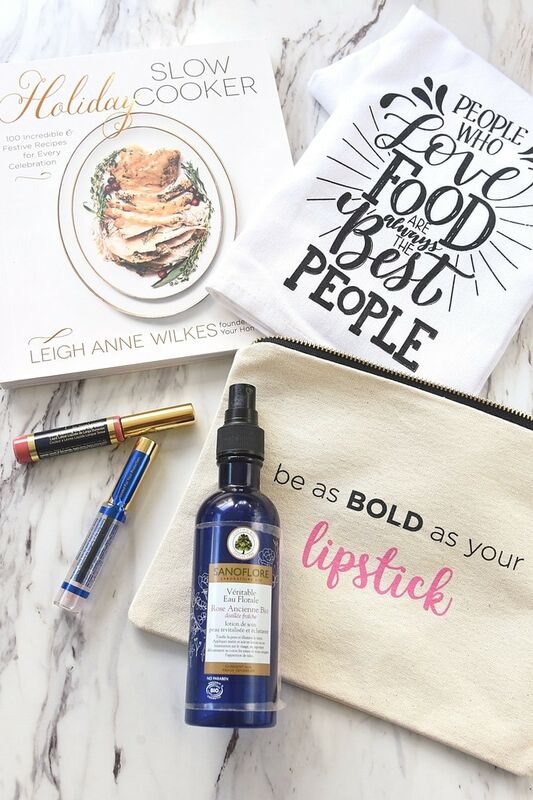 This bag is the perfect thing to store another one of my favorite things in – Lipsense! This stuff is amazing! Have you tried it? I put my lipstick on once in the morning and then I’m good to go for the day. Seriously! I love this stuff so much I’m giving away one of my favorite colors and some glossy gloss. If you don’t know someone that sells it, let me know and I can get you hooked up! Last but not least I have included a bottle of Sanoflore Rose Water. I LOVE this stuff. I spritz it on my face first thing in the morning and throughout the day and it helps brighten, purify and calm my skin. I especially love it when my skin is feeling dehydrated and needs a boost. It’s perfect for travel too and I love the way it smells. I seriously use this multiple times a day. I hope you will enjoy my favorite things as much as I do. Now scroll down to see what my friends are giving away and to enter my giveaway! I’ve teamed up with 29 creative bloggers and we are all sharing some of our favorite things right now, and each of us will select a lucky winner! What you need to do is make sure you HOP to each of our sites to enter to win the giveaway on each site. Yes, that’s 30 in all, but you’ve got a week to do it…plenty of time! While you are there, we challenge you to click around to see what they have to share, you may just love them as much as we do! Now, here is the HOP! Click on the links below to enter each of the prizes. Somedays within the first few hours, the direct link can get broken, if that happens, click on the home page of that site to find the post or go back shortly. Giveaway ends Thursday, November 9th at midnight, so make sure you enter each of the 30 prizes. 26: R We There Yet Mom? Now, time to enter MY gift! What a great collection of goodies! I would love to win! One of my current favorite things…candles everywhere! My favorite thing is the wet brush… it’s cut my hair brushing down in half! One of my favorite things is Bath & Body Works wallflowers air fresheners! I love to change them out for every season! I just started working part time and could really use the slow cooker cookbook. I love my Lash Princess mascara!! So hard to say just 1 thing, but I LOVE a big fuzzy warm blanket. Even in the summer, I am always cold! One of my absolute favorite things is Anderson Lilley Beach Butter Body Cream in the Sicilian Tangerine scent. It is truly AMAZING!! Gosh! I love all of your favorite things, but I would have to say the Holiday Slowcooker recipe book has me intrigued! I want to sneak a peek and peruse through it! One of my favorite things is Tulsi Chai Tea. Cozy flannel pajamas with a holiday theme. Some make up and a nice and soft throw. My favoirite thing would be a Target gift card. There is nothing better than a soft, warm, cozy blanket!! What a great giveaway!! Right now one of my favorite things is my Instantpot! Life gets busy with two boys in sports and such it makes meal times so much easier. Ah…one of my favorite things is flavored coffee. I like them all but hazelnut is the best! Love everything in this package, love the dish towel! I love reading books under a cozy soft blanket! My favorite thing is yarn – lots of yarn. I’d love the slow cooker cook book!!! New favorite things to add to my list. What a great list of treasures. ooohhh Would love to win something…they’re all great! My daughter is a Lipsense distributor. The company also sells skin care, eye shadow, etc. I love the Lipense and have ten colors along with glosses. I also have the tinted moisturizer, mascara and eye makeup remover. I love all of these. What fun stuff!!! Ive been wanting more Lip Sense for sure!!!! What an amazing giveaway! Thanks for the chance to win! I love Lipsense too! And your new cookbook is on my Christmas wish list! I want to try Lipsense! Lately my favorite thing has been my essential oils diffuser…. with sweet orange oil – it smells so good! One of my favorite things is Vionic flip flops! Because we have such wonderful weather in CA I wear them all year long! I love cooking in the Slowcooker! One of my favorite things are Sharpie pens. They can do anything! I like candles! Lots of candles! I LOVE cookbooks and your book would really come in handy this fall/winter! Thanks for the opportunity to enter! Would love any of these, they are all my favourite! I love peppermint scented lotion!! And I would love to win! Love, love scented candles around the holidays! What a great website you have too. Love the giveaways! The bags are so cute and I am drooling over the cookbook recipes. My pressure canner is my favorite thing!! I am so excited about this years give away prizes, and I would love to win any of them! My favorite thing is the opportunity to win! Fun giveaway! Love your new book! One of my favorite things is lavender essential oil! Love using the slow cooker when I find good recipes for it. Wow they are all so FUN!!! But who wouldn’t love a holiday crockpot cookbook !!! My favorite thing is my brow gel. Gives me a nice groomed darkened brow. Watching beautiful sunrises while sipping hot chocolate on a cool November morning! Good chocolate, unsweetened iced tea, and my essential oils. One of my favorite things are my mukluk slippers. They are so warm and cozy. What a great giveaway!! Love the cozy, warm blanket! Out of what you are giving away I love that kitchen towel! One of my favorite things is the Instant Pot! One of my current favorite things is the apple pencil! One of my favorite things is Caramel M&Ms! I just got a new camera, a Canon G7x and I absolutely love it! My favorite things on this first snowy day are time to play with fabric in my studio, a cup of Earl Grey tea in hand, while soup is simmering in the pot in the kitchen. Thanks for the great giveaway and a reason to daydream (another favorite thing). One of my very favorite things is eating York peppermint patties and drinking Pepsi out of a fancy glass while watching a Hallmark Channel Christmas movie! Life is crazy, so I try to enjoy the little things! One of my favorite things right now is my new Roomba! Right now I am totally into cookbooks, and so many beautiful ones are being published it makes me happy! My favorite of all time is Julia Child’s Mastering the Art of French Cooking!! 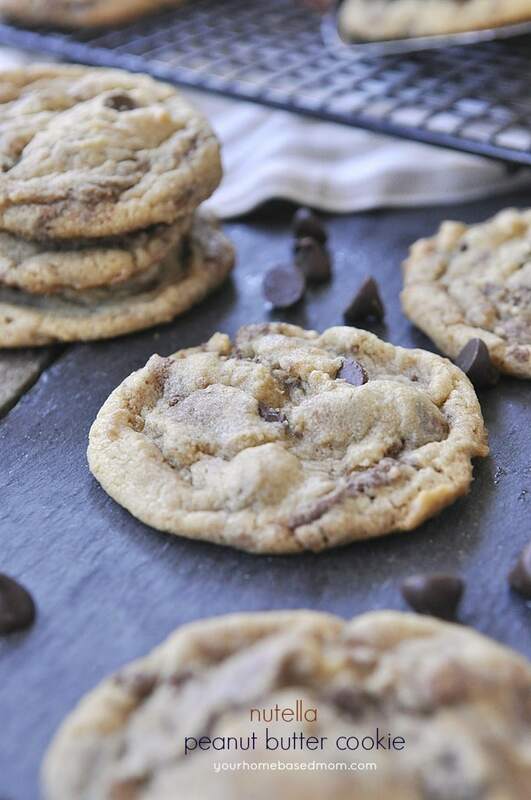 Homemade chocolate chip cookies are my weakness! And I’m slightly addicted. 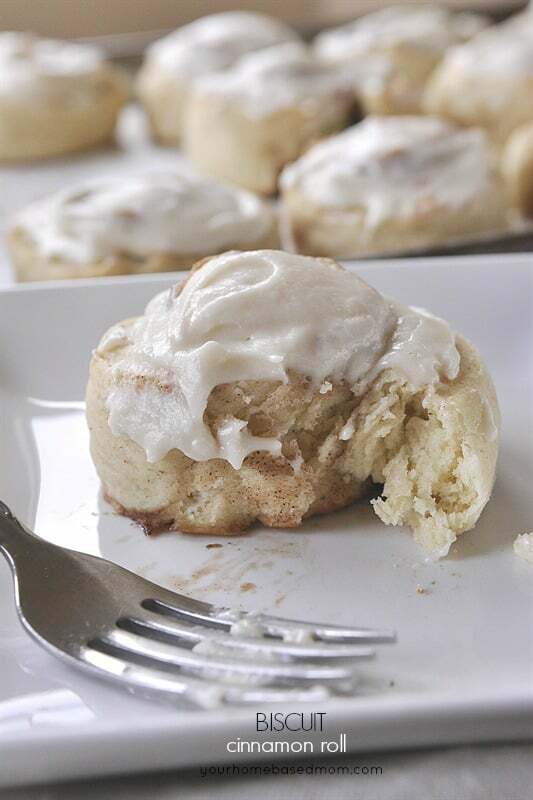 Found the best recipe on Pinterest! So, I guess you could say one of my favorite things is Pinterest as well! Haha! What a great gift. I love fresh scented candles and my pressure cooker. Such a wonderful giveaway collection! Fingers & Toes crossed! I love cute aprons. . . and toffee. Oooh, anything slow-cooker is a win in my book! I love crafting with my kids. We have a craft room and great memories are made when we are hanging out there! I love the make up bags. They are so cute for gifts. My favorite thing right now is my new running shoes! Batiste dry shampoo is a current favorite of mine. I love Bath & Body Works Candle. One of my favorite thing is any kind of sugar scrub. Love that stuff. I love all of the items especially the makeup bag! My favorite things is chocolate and coffee. I’m loving my DoTerra Essential Oils!!! My nespresso machine is most definitely a favorite!! I love a good fluffy blanket…. and peanut M&Ms! My favorite thing is my husband, my kids and my grandkids- they make me so happy! I love Perfectly Posh’s beach blanket sugar scrub and 911 Moisturizer. My favorite thing is Books! My iPhone is one of my favorite things. I am loving the look of your new cookbook! That would be my favorite item within your giveaway. That cosmetic bag is pretty cute though! Tough choice. One of my favorite things are Frixion pens in pretty colors. My husband recently bought me a set that has the prettiest pink. I love that it’s a comfortable pen with easy flow ink, but erases. I’m addicted now. I love Brooks running shoes. My absolute favorite thing is my 10 month old grandson! My favorite thing is definitely my Kindle Paperwhite. My planner is my absolute favorite thing I’ve purchased. Favorite things – girls night out with my one and only daughter! One of my favorite things is Ghiradelli Dark & Sea Salt Caramel. Your cookbook & tea towel would be at the top of my list! What a great collection of fun items. I couldn’t wait and ordered a dish towel. Such a hard question.. I have sooo many favorites. Given the cold weather, I’m going with the Salted Caramel Mocha at Starbucks. However, I sub the chocolate mocha for white chocolate mocha. Yummmm! One of my favorite things is the Amazon KIndle Fire! Sanoflore Organic Ancient Rose Floral Water would be nice !!!! I think my favorite thing lately is quiet times with my husband and dog with a cup of gingerbread tea and some handsewing. Gee, that Rosewater sounds nice and I sure know a few people who would love those towels! lipstick that stays on! I love this blog! Gorgeous meal ideas! British Rose body butter from The Body Shop. Such a lovely rose scent. Thank you for giving us the opportunity to win goodies! I love my slow cooker and I would love the holiday slow cooker book so that I can make some delicious holiday meals that will be ready when I get home from work! I love slow cooker recipes! One of my favorite things is “Beautiful” perfume. I absolutely love cooking with my slow cooker! So much so, my granddaughter gifted me with one of another size! She really knows me well! Thanks for the giveaway and I know your new book will give me hours of enjoyment!! One of my favorite things is my Toshiba tablet. All of my recipes are stored on it so I don’t have to print a recipe to make it. Love Zella high waist leggings as a fav! One of my favorite things is my Instant Pot! One of my favorite things are blankets! They keep me warm and content!! I totally rely on my Kitchen Aid stand mixer. Love this set of favorite things! That cookbook looks amazing! One of my favorites is lip gloss. I love dragonflies of every kind. I have them all over my house. Bath & Body Works lotion and candles! I love my scent warmer right now! There are so many good fall scents and I love that my house smells like fall! I have had my Instant Pot but it is my favorite thing right now. One of my favorite things is lavender soap. The scent is so nice and relaxing and reminds me of some of my wonderful visits to spas during my travels. ONe of my absolutely favorite things is Goose Creek candles! I always have them burning or the wax melts melting!! I have a weakness for that company! One of my favorite things is Mary Kay Timewise Moisturizer. I got rid of cable because I got my hours cut at work and we can’t afford it so I would love a firestick that would be my favorite thing. One of my favorite things is bracelets! I will wear one everyday! I have way too many but can’t help but buy more!! My favorite thing is my Kindle Paperwhite. I love to read and it stores all my favorite books. My favorite thing right now are audiobooks (I use Audible). Getting chores done and getting through new books – win! I love lipsense! And I’m excited for this giveaway! My favorite thing is Stranger Things on Netflix! It was so good! Loved it! My favorite thing is the WetBrush. It is the best hairbrush I have ever owned. Amazing. christmas scents (cranberry spice, cinnamon, etc)! My favorite thing right now is my new Instant Pot. One of my favorite things is Ball jars. I love using them to can but also for all sorts of crafty purposes. Iced coffee is my favorite thing! One of my favorite things is Christian romance fiction! There are SO many quality authors out there! I love it! One of my favorite things is peppermint-candles, candies, coffee. I love your recipes and food pictures! I look forward to seeing new posts. Not new or exciting, but this time of year Burt’s Beeswax original lip balm is my favorite! One of my all-time favorite things is dark chocolate. One of my current favorite things is my Tens unit. Great for back pain! Trident cinnamon gum is a new favorite of mine. MY favorite thing would probably be food. I can’t live without it. One of my favorite things is Burts Bees chapstick. I love sweets! Anything from chocolate to cake! Awesome Giveaway! I love fabric! I like little things like ceramic birds or antique tin boxes. One of my favorite things is my journal. Absolutely love all slow cooker recipes! Ive heard about me rose water a couple times now. It sounds great! Chocolate covered sunflower seeds is one of my favorite things! I’ve been wanting to try some lip sense! One of my favorite things is a beautiful planner with inspirational quotes! My Silhouette cutting machine is quickly becoming one of my favorite things! Coffee is one of my favorite things! Very excited to try this cookbook! I love lipsticks and books! One of my favorite things is brightly colored pens! Love your new cookbook. It looks beautiful. My favorite thing is project life! My favorite thing right now is Mrs. Meyers cleaning supplies, I love the smell! I’m LOVING my new Instant Pot! Books, coffee, and wine are my favorites! One of my favorite things is clinique pep start moisturizer- ithe is a lifesaver for my dry skin! Your wonderful ideas inspire me! I’m currently loving new shows – Mindhunter, The Good Doctor, etc. One of my new fave things is the OUI yogurt by Yoplait. It is SOOO Good!!! I love Henne Organics tinted lip balms! My Instant Pot pressure cooker!! My favorite current thing right now is a day off of work and a quiet house so I can get back to my sewing machine. I have two UFOs that need to be finished! Love your blog! So glad I found you! I love candles and cozy blankets! I love your slow cooker cookbook. 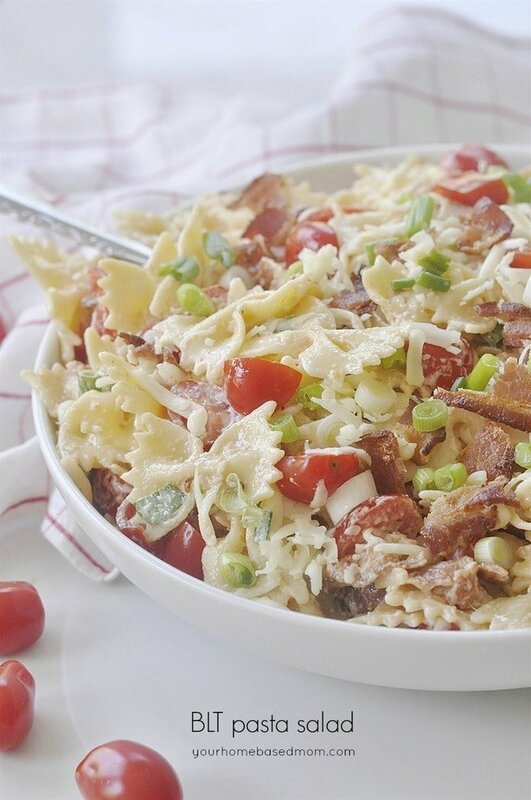 That’s one of favorite things to do…using the slow cooker. One of my favorite things is anything pomegranate! Drinks, food, candles you name it I like it! I’m loving my fun new letterboard! One of my favorite things is chewy chocolate and caramel candies! I love Covergirl Outlast lipstick! It’s my NEW favorite thing! My latest favorite thing is my Instant Pot. Pumpkin spice caramel chocolates from Ghiradelli. YUM! One of my favorite things right now is snuggly throw blankets in beautiful colors. And now that it is fall, I get to indulge in the best cool weather activity: reading under a warm blanket. One of my favorite things is my books. Retired and on a budget. I hope I win! Being loved by your family and having everyone home! My favorite is the Norwex clothes for washing windows!! I love to cook new recipes in my slow cooker. One of my favorite things this year is a Kindle Fire. On of my favorite things at this moment is waiting on the arrival of my 2nd grandson. I’m currently not working so I see a lot of spoiling in my future. So much great stuff, hope I win! I love chocolate covered hazelnuts in Ritter Sport Bars! One of my favorite things is having my family come into town for the holidays. Everyone gathered together for fun and laughter and good food. Especially around Thanksgiving and Christmas. I really love my big cup! One of my favorite things is my Kindle. I love my Instant Pot – it saves me so much time! One of my favorite things is BITE lipstick from Sephora! All the pretty color without the nasty taste. One of my favorite things is our newly rescued kitten. He is very sick right now, but we are doing everything we can to get him better. Please send us happy, healthy kitten thoughts. Love your blog! I am following you now. One of my favorite things are Cuddleduds fleece leggings. One of my favorite things right now is L’Occitane hand cream it is amazing! One of my favorite things right now is my new eye cream – Halloween is definitely over and I no longer look like I have the sunken eyes of a zombie!! What fun goodies! Thanks for the opportunity. I love candles that smell like cinnamon. I love my Keurig to make a yummy cup of coffee! One of my most favorite things is music. I love having music on. My Hydro Flasks. Who knew how attached I would become to them!!!!! My 2 favorite things right now is my new instant pot and a warm cozy blanket. Thanks for the opportunity to win! My favorite things right now are my throw blanket and my fall candles! I’m loving my cozy cardigan! I love Urban Decay setting spray! my first time here…. looks interesting, I think I’ll have to stay a while! The cookbook looks great!! I love chocolate! One of my favorite things is Penzey’s spices. They are super delicious and have some amazing blends! My favorite thing in the world is my sweet tiny and brand new baby girl. Love your items included in the giveaway! Bags of all sorts are my favorite right now…makeup bags, art supply bags, library bags, reusable shopping bags! I would love to try the Sanoflore Rose Water. That towel is just too cute! Thank you for the opportunity to win it. 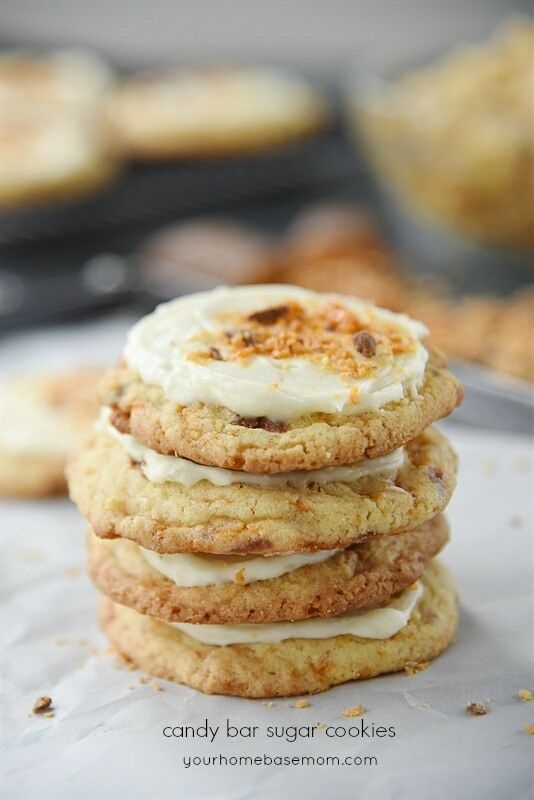 I love to bake anything with pumpkin in it when the weather gets cooler. A bonus is the smell in the house. my favourite thing is my essential oil diffuser with Peace and Calming oil. One of my favorite things is a comfy pair of cashmere socks. It’s a fantastic thing on a Michigan winter day! One of my favorite things are the chai Trim Health Mama lip balm! I would have to say craft supplies and nail polish would be two must haves in my favorite things. Would love to win these goodies! My favorite thing right now is Danskin joggers. One of my favorite things is my new set of Clover Amour crochet hooks!!! I love slow cooker meals!!! I like soft cozy socks!!! Cocoa butter lotion is one of my favorite things! Cozy slippers and hot coffee! I’m totally into bath bombs are the moment. I love reading a good book and taking a relaxing soak! One of my favorite things is my Mormon mom planner, it is kinda my brain on paper. OOOh, such a pretty lip color! I have still been so intrigued in those! Lately, I have been loving this Malin+Goetz mojito lip balm. It is wonderful! My favorite thing right now is burning seasonal candles! I think your combination of gifts is great. Thanks. I like your blog. One of my favourite things since I was a kid was snowy days. I would love to win your new cookbook! One of my favorite things is my HydroFlask. It keeps my water cold all day! I use it everyday! 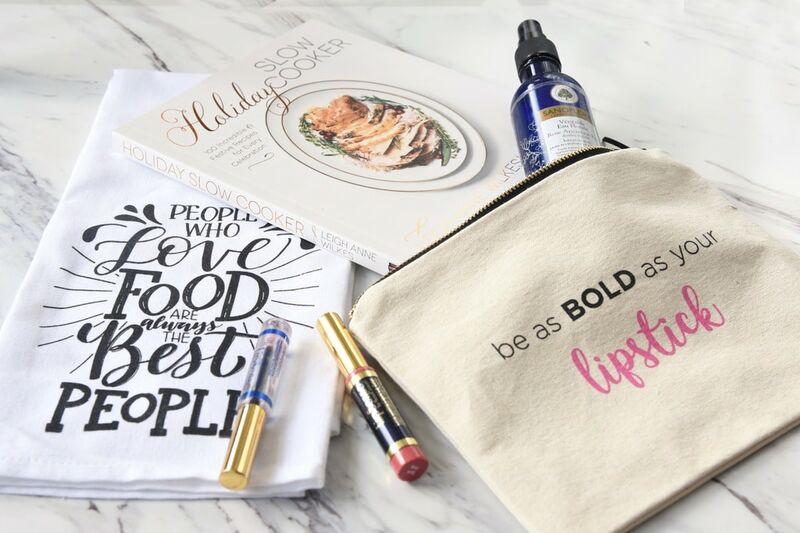 Would love to try lip sense…great giveaway package. I love my silicone baking mats! I am obsessed with Soft blankets! Great blog! Love Lip Sense too! I am excited to see that cookbook. Slow cookers are the best for having a meal ready to go when you get home. That’s exactly what I need – especially at the holiday! My Tieks are my favorite! One of my favorite things is Spongelle, it’s a sponge with body wash and one side has a scrubby surface I just love the scent. One of my favorite things is hidden treasure candles. I couldn’t decide on one item, each one is great, I would love to win! Currently one of my favorite things is the Instant Pot. Still pretty new to it, but it’s a fun new thing to try and learn. Hydrationist skin cream is my favorite. one of my favorite things is my microwave rice cooker – perfect rice every time and easy clean up! Wooden things….wooden spoons/bowls/servers whatever…if its wood, I love it. One of my favorite things lately is cinnamon flavored lip gloss. One of my favorite things is a good book! Thanks. Currently I am LOVING my new washer! I love lattes of any type. My current favorite thing is my travel mug! Love using my slow cooker during the week so the cookbook would be perfect! Would love to try the Lipsense. I’ve heard great things about it. Long-wearing lipsticks are usually very drying. This one isn’t?? What am I loving right now? All of the Christmas movies on the Hallmark Channel. We have a small pitcher that we use to refill the pet water bowls in our house. Using this little pitcher instead of the larger, heavier, clumsier pitchers has made my life easier and better every single day and I love it. It is one of my favorite things, and it cost $4.95 at Target. My RBX socks are one of my favorite things right now! I love L’Occitane shea products in the lavender scent. from your giveaway, my fave is the makeup bag but i have lots of favourite things…my kids are my most favourite of all. I’m loving The Warden wine by 19 Crimes. It’s a red blend that is so good. Currently my favorite thing is my Canon Power Shot .. my husband gave me for my birthday. I love anything that is cooking related. Cooking is my #1 passion in life! My favorite is my crock pot. So, I would love to win this. Thanks! Just subscribed! How have I not found you before now?! Great collection for a giveaway! One of my favorite things is homemade cold-brew coffee! One of my favorite things is my rolling cart from michaels. It’s great for holding my yarn and I can hold my Books in it too. One of my fav things is to sprinkle cinnamon over ground coffee beans before brewing. It mixes in perfectly & smells wonderful. Thx for the chance! Love love those towels! I am on my way to the Etsy shop to check them out. They are the perfect gift. Scented candles are great around the holidays! One of my favorite things is my iPad Pro. I love you Blog!!! Thank you so very much! One of my favorite things is a hand-knit wool scarf that my sister made for me. I’m so glad to learn of you site. I love it. All the wonderful recipes and things you offer. I have signed up. Thank you for a chance to win . Liked you on Facebook. I love my AG Recoil Curl Activating Cream! It’s one of the few hair products I cannot live without. I have never been one to wear lipstick often because I had to reapply through the day. I tried Lipsense last year and I love it! My favorite thing lately is OPI nail polish. Love your blog and all the inspiration you have! Fun giveaway, thanks for the chance! One of my favorite things is my ipad case–it’s floral and pink and makes me happy! Some of my favorite things right now are any extra sleep I can get 😉 and dinner services like Hello Fresh… it makes dinner easy and fun! I love Book Chicka Pop kettlecorn. The cookbook looks like a good one. One of my favorite things is Arbonne FC5 Ultra-Hydrating Hand Creme – it’s not greasy, but hydrating and I love the scent! Currently my favorite thing is my TUL GL Series gel ink pens in every color!!! This is so fun! I love your giveaway! New books! The smell, the smooth cover and unmarred pages and corners…..ah! Exciting! Thank you so much for the fun! One of my favorite things is my robe. I got a Harry Potter robe from my son/sister-in-law last year and it makes me happy every time I wear it. One of my favorite things are candles. Lighting candles can change the mood in the room and help me relax. I love cute glass containers. I love my mini spatulas from Williams Sonoma! Handy and cute. BOOKS AND MY ADULT COLORING BOOKS. My favorite thing is my Chi hair straightener! I take it with me everywhere I go! My favorite things that I couldn’t live without are a tie between my chapstick and my bath and body works hand cream. Candles (preferably white)…make everything look special! hempz vanilla plum shampoo and conditioner. True lime (granulated lime juice). I’m putting it in just about everything I drink lately! So good! One of my favorite things right now is Senegense Eye Shadow!! I like fleece socks especially now that it’s getting colder! the slow cooker book for sure! One of my current favorite things is my essential oil diffuser. One of my new favorite things are the Sweet Dreams scented Bounce dryer sheets. I know it seems silly, but they smell so nice! I don’t know if I’m doing this right but I want to enter in the drawing. My favorite thing in your bundle would be trying the lipsence. Never tried it! My own favorite thing is Vaseline Intensive Care shower lotion! One of my favorite things is my new InstaPot. I’m still learning, but so far, I’m loving it! I love the convenience of my slow cooker – I definitely need to check out this cookbook whether I win or not! One of my favorite things these days is my electric heated throw! As it gets chilly outside one of my favorite things is a cozy throw blanket! One of my favorite things is really good dark chocolate! I’m currently a little obsessed with my favorite herbal teas. Cold weather and warm coffee! One of my favorite things right now is pottery mugs. Filled with coffee, of course. One of my favorite things right now is the Outlander Series (both the books and the Starz show!). Chocolate is one of my very favorite things! The darker, the better! Love this! Thanks for the great ideas! I’m loving my small electric blanket in our family room. It’s helping keep my feet warm and toasty. My favorite things are candy and old photographs. These are all amazing little gems! My favorite thing on the planet is matcha. Slow cooker meals are mt favorite they really make me feel at home and they leave such a wonderful smell all day. My favorite recipe from my mom has to be her slow cooker creamy chicken. There are never left overs that night. One of my fave things are Reese’s peanut butter cups!! SO. GOOD. One of my favorite things is the Mr. Clean Magic Eraser. Love how it eliminates dirt, grime, and stains. Thanks. I love the Vidalia chopper. I use it daily! Be as bold as your lipstick makeup bag is one of my favorite things. One of my favorite things is buffalo plaid anything! One of my favorite things is Almay Clear Complexion Oil Free Concealer – I don’t know why I chose that one to share. I love pumpkin flavored anything this time of year, but I really love Ginger Chews from Cost Plus World Market. Super cute! I would just love to win these!!! One of my favorite things is my wood burning stove! It all looks fantastic but I would love your holiday slow cooker book! I have 2 favorite things at the moment – one is the new shiplap wall in our family room and the other is pumpkin/cream cheese roll. I can only find it during this time of year. Probably will be gone after Thanksgiving. You gift box is fabulous!! Beautiful collection! Love your taste. Would love to win to try some new things! So excited to visit all the blogs listed. Great times. Chocolate chip cookies and diet coke! I love slowcooking! This looks like a delicious cookbook. That lipsense!! Always great to have! One of my most favorite things ever is a hot cozy cup of tea – my current favorite being a cinnamon chai! Love all your favorites, some great recommendations to try out in there! 🙂 glad to have found your blog! My sweet, crazy dog, Roo! One of my favorite things is my Simple Modern water bottle. It keeps my water ice cold all day long! My favourite thing is Bath and Body Works C.O. Bigelow Violet Mint Mentha Lip Tint. Keeps lips smooth and shiny with a hint of tint. And the mint feels SO good! I’m loving my house slippers right now. its starting to get cold. One of my favorite things right now is the (finally) cooler temps. I love my new ankle boots I bought on Jane!! Must I choose I love it all! Yay! So excited! Just got an email that I am the BIG WINNER! Can’t wait to receive my goodies! THANK YOU!